I went into Leeds today. I had a few errands to run, the sun was shining and I thought I would make the most of it. I got off the bus in City Square and saw this. 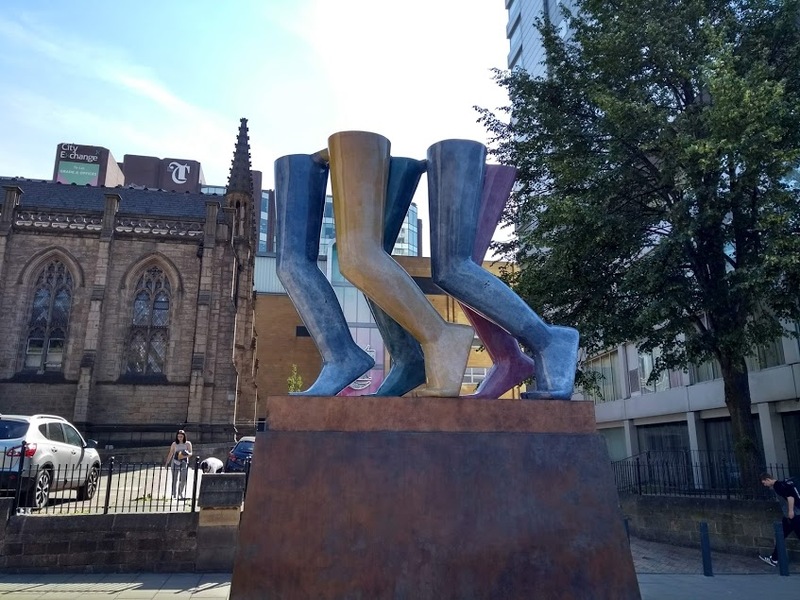 It’s a statue of some legs, in case you haven’t guessed. It’s been done very well, and someone has gone to a lot of trouble and effort and it’s bright and colourful and contemporary. I wasn’t sure about it, though. I’m not educated in Art, and I think if you have a fine arts background and you know more about context then it’s probably a really great piece. 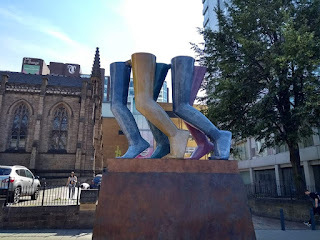 For a philistine like me, it just looked like some colourful legs. There’s some more about it here. 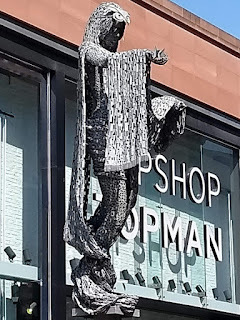 A little later, in Briggate, I took this picture. As you can tell, I’m not brilliant when it comes to pictures. This is a statue of Minerva, apparently, and I think was sculpted more recently. As I said, I’m completely uneducated, but I love the way that the solid metal is made to look like fabric folds. 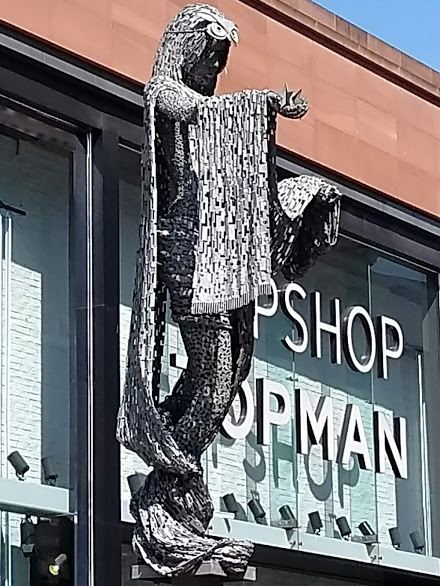 According to a snippet here, Minerva was the goddess of weaving and commerce which is absolutely perfect for Leeds which was built on textiles in the eighteenth and nineteenth centuries and I love the owl mask, as owls are on the Leeds coat of arms. I understand this as much as I understand anything. It tells me stories in the way that the Legs don’t. The question is – are they both ‘Art’? Of course they are, and some people will prefer one and some the other. In both cases someone took an idea and translated it into something solid using skill and passion. The problem isn’t in the sculpture, the problem is in the question. The question is poison. In Leeds Art Gallery there is a huge canvas painted blue. That’s it – just a vast, flat, blue rectangle. My instinctive reaction is – someone had a sale on blue paint. However I have been told that there is a lot of skill in getting an even tone and texture over such a large canvas and that those who paint will really appreciate it. I know that whoever painted it did a better job than I could ever do. Who am I to say that they are wrong? That question – is it art? – is poison to writing as well. You can be caught up writing the most exciting, challenging, thrilling story. You can see the action, hear the voices, even smell the smoke and flowers but there is always a little doubt. There’s always a little niggle. Are the characters deep enough? What about extended metaphors? Have I let an adverb sneak in? Should I have included this character? Should I have cut that character? I need to edit more. I think that the questions you should ask are things like, are the characters believable? Are they consistent? Do they have the same eye colour from one chapter to the next (it happens!)? Does the story make sense? Does it have variations in pace? How about the descriptive passages? How does the dialogue sound? All these are valid questions. You should never stop unless you can say that you are proud of it. But if you find yourself asking, is it art? then I think you need to step away from the writing and do grocery shopping or cleaning or something that ties you back to the mundane. From my experience, chasing Great Art is bad for the mental health.